With the rise in popularity of home dressmaking and couture style DIY fashion as well as the popularity of programmes like The Great British Sewing Bee (#GBSB) and the sell out success of the recent incredible Dior Retrospectives in both Paris and London, there is a lot of renewed interest in shape, cinched waists and making Dior shaped dresses and clothes. Hand in hand with this, there has also been much talk of proper metal corset boning and how 'difficult' it is to use. What is corset boning used for? Spiral steel boning is used in corsets and in couture garments for strong and enduring boning support. It is made of steel which has been formed into a continuous spring which has then been flattened. 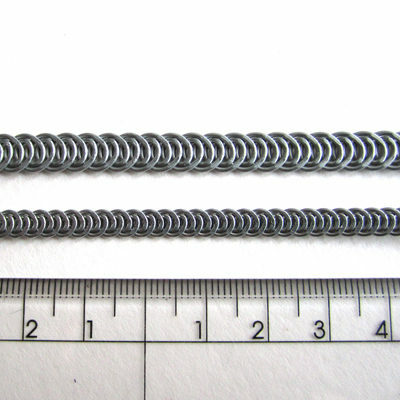 Because spiral wire boning is a flattened spring, it is extremely flexible and can bend horizontally and vertically (backwards, forwards and sideways), making it perfect for boning over and around curves. In couture garments - ie: within a dress foundation, it is used in conjunction with 2 layers of tulle or bobbinet which is a very fine and very strong netting material which when layered together, has no stretch but provides a fine, non bulky foundation inside a gown. In corsetry, sprial wire boning is most commonly used in conjunction with coutil fabric and often in partnership with flat sprung steel bones which are not as flexible and therefore useful when a firmer, straighter support is required. Both types of steel boning were invented during the Victorian age and used instead of whalebone. Spiral steel boning, sometimes known as spiral wire, comes in various different widths, from 4mm-15mm, and various different thicknesses making it possible to 'mix and match' your boning to achieve whichever level of support is required for any particular project. For instance, you may only need a light 5mm wire to bone a net bodice, but you may need a more robust 7-10mm wire to bone a multi-layer corset for tightlacing. With all boning, there is flexibility! Flat steel boning, sometimes known as spring steel, also comes in various different widths and thicknesses from 2mm-20mm and is used for a huge range of applications including dressmaking, costume making, corsetry and for making hoop petticoats. In corsetry it can be used all over the corset, but is always used in the centre back panels either side of the eyelets. This is becuase the back of the corset absolutely must be straight and strong. All types of boning, whether steel or plastic, comes either in pre-cut lengths or in continuous reels. It isn't any more economical to buy your steel in a roll and cut it yourself so you have a vast choice - corset makers who make 'standard size RTW corsets' know which lengths of bones they need and will order each length in bulk. Corsetieres who favour a more bespoke approach will order in rolls and cut to length as required for each project. Sometimes you cant get pre-cut steel that's long enough, for instance in a corset dress which will go over the knee or below the hip. Many are put off by the supposed requirement for 'brute force' with which to cut it. Flat steel can be cut with tin snips - there's a knack though, or plain old bolt cutters which will treat flat steel of any thickness like butter. You can cut spiral steel with bolt cutters too if you have them. However, if you don't have bolt cutters, spiral wire boning is easy peasy to cut and tip and there is a tutorial on how to do this right HERE. As one of the most important 'ingredients' of a corset, boning tape is one of my main fixations in life when it comes to sourcing the good stuff for my own work and consequently, for you, my lovely customers - I've said it before and I'm saying it again, I only sell stuff that I use myself. It's tried, tested and given my seal of approval for learners and pro's alike. So, boning tape. What's on the shelves here? Lets take a look and talk about each type and their pro's and cons. If you want the quick version, just take a look at the video here. This is the cheapest type of boning tape that I sell, and it comes in three colours and three widths. It took me ages and ages to source this stuff, and I have only ever known one British wholesaler who sells it how I like it - all others are inferior versions or they are not cotton. So what I have here, is pure 100% cotton twill tape which is densly woven, strong, durable and not bulky. The twill tape at Sew Curvy is acutally made for upholstery projects, not corsetry, and that is what makes it strong and durable. If it's good enough to support your armchair, it's good enough for your corset... but don't be fooled. This twill tape is not bulky or clumsy in any way. Herringbone twill tape for corsetry - can be used as lovely strong boning channels or for busk facings and waist tapes. 100% cotton twill tape, easy to sew, strong, durable and smooth. 25mm - for double or triple boning channels depending on the width of your boning - this is especially popular for double boning channels in Edwardian corsetry. Cotton herringbone twill tape is good for all sorts of corsetry, but particularly for Edwardian corsets where the boning channels run vertically up and down the corset, and not along the seams as in Victorian corsetry. This twill tape can be used in single layer corsetry, but I and others prefer to use this when the finished corset will be lined. It's a good tape but it's still a 'budget' option. All widths can also be used as a strong waist stay although not my preferred choice for that. Not the prettiest tape, and can fray at the edges if cut too soon before binding. Not good for uber curves as there is no stretch or tolerance in this tape. *Lets not forget that the corset industry in Victorian times was big business. There were coutil mills all over England and Europe, there were lots of different steel factories all over the place because busks and (later) steel bones were in huge demand. There were special machines, special materials and special processes that were created for corsetry, that we don't have these days because there isn't the demand there was back in the day. Nowadays we have different materials, processes and machines - they are different but not inferior and that's what we have to work with now. It's no big deal. Times change. We still have twill tape suitable for boning, it's not the same as Victorian boning tape, neither is steel, neither is coutil - there are literally only one or two original steel factories and coutil mills left in the world none of which are in England whatever you may hear. Trust me. I've looked for them, and they don't exist. This is a cotton viscose blend tape which is basically a flat tube in which you put your boning. It has 'tracks' on both edges which makes it easy to see where to sew. This tape comes in two colours and one width (it is available in other colours and widths but as yet, not at Sew Curvy). This is a very fine boning tape which is also very strong. It's much smoother and prettier than the herringbone twill tape, and it's also alot more expensive. Is smooth and professional looking - can therefore be used without a lining. Has a small tolerance for curves due to the special weave. For wedding and pale corsets where the grey steel of boning can show through - this tubular tape adds a nice dense layer between the bone and the coutil so there is no show through. In corsetry where a smooth professional finsih in unlined (single layer) corsets is required. It's expensive and not always necessary if you're making a corset where the innards will be covered up. Whilst it's better quality than the herringbone twill tape, it doesn't do a better job than twill tape, it does a different job. Coutil boning channels are the best for strength and durability and, they can make very pretty boning channels and reduce waste - they are a fantastic way of using up your odd bits of coutil ensuring very very little waste and therefore economising in the process. They can be made in several ways for different applications. First, and most obvious is the plain 'bias' strip. I say 'bias' in inverted commas because I rarely actually cut the boning channel on the bias. I cut it on the straight grain, and put it through a bias folder. Several reasons - the straight grain is stronger, non stretch and less prone to 'wrinkling' through stretch. Only on the most uber curvy bits (ie over a large bust or big hip spring) would I use this tape on the bias. To make a good size channel for 7mm boning, you need the 12mm bias maker, cut strips 2.5cm wide, and iron them through. Coutil boning channels made with a bias maker look so lovely and are a very economical option as well as strong and durable. Use up your scraps! 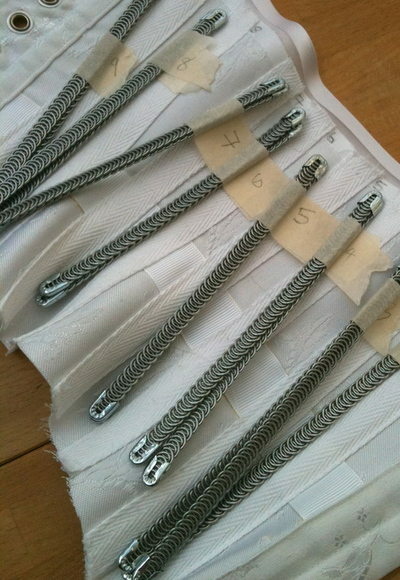 The second way to make your own coutil binding is with pressing bars - and there are two ways to do this. First, you could make a tube - again on the straight grain - press the seam allowances of the tube over the pressing bar, and apply the channel over your seam - this is good for external boning channels or sheer corsetry where you want your bones to be invisible but need strength. A corset made by my friend and colleague Izabela of Prior Attire. She folds her fabric around the pressing bar, centres the resulting strip over her seam, stitches it down in the ditch, then stitches either side. Otherwise, you can simply use your pressing bar as a folding device, cut your boning channel to the required width (this is a particularly good way to do double channels), then press the sides over the pressing bar, making a crisp outer edge. Line up the centre of the tape with your seam, stitch in the ditch, then stitch down each side. Bingo - perfect double boning channels on your corset, matching, and minimum effort. Pressing bars are therefore good when you're using less bulky coutils, or when you're using fused fashion fabric on coutil. Coutil boning channels are strong, durable and colour co-ordinated if you want them to be. Economical - use up your scraps! Cutting out a corset and boning strips uses most of your fabric that wouldn't otherwise be used. I call this "fabric economy". What NOT to use when boning a corset? Well there are several things that I don't think work well for corset boning channels. Grosgrain ribbon, polyester ribbon (even double faced) and seam tape - these will work if you have absolutely nothing else and no other option but they do tend to wrinkle in a very ugly way if you're not uber careful. They are also quite thin and can fray/wear quite easily if you don't secure them well enough at the edges under the binding. I have tried them for a fancy option and whilst not impossible, they are quite difficult to deal with. Having said that, sometimes a thinner option like this is the only way to make a channel where the 'look' is more important than the purpose, ie: when you need to fold over the edges to acehive a 'floating' effect, as in this sheer corset which has narrow grosgrain ribbon for it's boning channels. Tailors tape - this can be used for a waist stay because it's fine and non stretch, but although tightly woven, it's a bit too thin to use as a boning tape unless your corset is for light wear only. Tailors tape - brilliant as a waist stay, not so good for boning channels. Fashion fabrics - unless your fashion fabric is very dense, or is interlined with something strong yet light, you will get bad results with fashion fabric on it's own with regular corset boning. Having said that, if you use very fine boning, it could work OK on light use corsets. So there you have it. There are many opinions about boning tape on the interwebs, some of them quite ill informed because they come from a very narrow viewpoint. As a shopkeeper, I am lucky because I get to explore all the options and bring the best ones to you, my fellow corset making addicts!